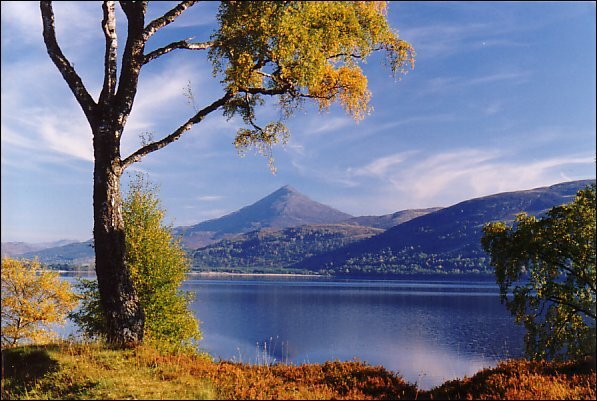 Schiehallion from the north side of Loch Rannoch. 'Schiehallion' is thought to mean the 'fairy mountain of Caledonia'. (Schie as in banshee, and 'hallion' from 'Caledonia' an ancient name for Scotland). Due to its uniform topography and geology, Schiehallion played an important role in 18th Century experiments to calculate the gravitational constant (necessary to calculate the mass of the Earth). This successful research also led to a major development in modern cartography - when mapping the hill to calculate its volume, the mathmatician joined the points of equal height and invented contours. Copyright © Transcotland Ltd. 1995.